In 1956, Master Sausage Maker, Fred Voll and his wife Käthe came from Schweinfurt, Bavaria, Germany, bringing with them to America, their craftsmanship old fashioned values, $53.00, a 2 year old son and a crate of their belongings. They got off the boat in New York, then headed to Fargo North Dakota where a Colonel in the Army had sponsored them. Fred got a job in the Armour packing plant, walking 12 miles to work and back because he had no car. Later he took a job with Red Owl grocery store as a butcher. To help learn English both Fred and Kathe bought a used television set. When the commercials were on, they could see and hear words and objects and relate them. Although at first he had his problems communicating with the customers, Fred became familiar with the language. Soon, he was assigned to work weekends, had to handle the books, and picked up some business saavy in the bargain. In 1959, when a position with Red Owl opened up in Madison, Wisconsin, Fred was asked to take the job. After a short time Fred was Manager of the meat department. He always had hoped to get into a business for himself, so he started distributing cakes on a franchise basis for SaraLee. In 1962, Fred decided to put his knowledge and training in the meat business to work. Fred at the age of 13, had started as an apprentice meat cutter for 25 cents a week working from 4 am- to 8pm. After passing the apprentice program, he attented a German sausage school and became a Master Sausage Maker. With that background, he purchased old sausage making equipment and had a small store front in downtown Madison. Fred made his real German Authentic homemade brats and the people came and wanted more! He began to make bigger and bigger batches. That is how the business began!! Fred and Kathe purchased land, Kathe designed and built a state of the art Federal Inspected Sausage Making plant. And that is where the sausage is made still today, the same way it always has been. Judy, the daughter has been involved in the busiess since she was 5. As the years went on, Judy made boxes after school, labeled sasage, helped in packaging and then learned the store and sales. 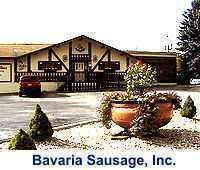 By 1981, the second generation of Bavaria Sausage "wurstmachers", Fred and Käthe's daughter & son-in-law, Judy and Steve, were totally involved in the family business. They have successfully worked their way into every aspect of the business and are handling the future of the business with innovative ideas and the old-fashioned values that the business was originally based on. Steve and Judy are now owner operators as Fred and Kathy have now somewhat retired! Fred still comes in and makes his special Blood & tongue products and Sulze, and he still loves to run our city route delivery to our fine restaurants in Madison. No recipes or the way we do things have changed in over 50 years. Our product is always consistant and true. Made in our sparkling clean U.S. Government Wurstküche. (Sausage Kitchen) Old world family recipes are turned into a wide variety of sausage and meat products. All recipes are still mixed by hand from traditional all natural bulk spices & authentic seasonings just as they always have been! We use NO artificial coloring, flavoring, liquid smoke, fillers or MSG! 'Never have and never will - It's just that SIMPLE. Our Bavaria Sausage label, proudly displays the "U.S. Government Inspection Seal" of approval. We believe our product and service represents the finest standards of our industry. Page Summary: Old world Authentic German sausage in a modern day Bavarian kitchen! The master German sausage makers at Bavaria Sausage, Inc. ship their authentic Bavarian fare nationwide: bratwurst, cold cuts,(aufschnitt), cooking and grilling sausages, knackwurst, Landjager, schinken, summer sausage, rouladen, sauerbraten, schnitzel, imported cheese, chocolate, marzipan, breads, coffee and more.